(CNN) - Last year’s soccer World Cup in South Africa was memorable for many reasons, not least because of the distinctive sound of the vuvuzela. The colored horns provided a unique soundtrack at every match and despite the predictable complaints from killjoys, the din added to a carnival atmosphere. This year’s Rugby World Cup has already proved itself to be as colorful, with supporters converging on New Zealand from across the globe with their replica shirts, flags, painted faces and even the odd Spiderman costume. But if you’ve watched Scotland grind out their recent wins over Georgia and Romania, one thing has been missing among their kilt-wearing supporters – the sound of bagpipes. That’s because tournament organizers have banned them from all World Cup venues, along with all other musical instruments. They’ve also outlawed umbrellas, flags with poles of a certain length and - rather curiously - car parts. Car parts you can understand. But bagpipes too? This is all the more surprising when you consider the Scots were playing in Invercargill, a small town in New Zealand’s South Island with a rich Scottish heritage. Even its streets are named after rivers in Scotland. The current captain of New Zealand’s All Blacks, Richie McCaw, also boasts Scottish ancestry and is known to be a keen piper. Now one Scottish fan is so incensed that he has written to New Zealand’s Prime Minister, John Key, to complain. He has also started a Facebook campaign to overturn the ruling, which now has almost 600 supporters. “After spending considerable money getting to New Zealand to support my country, I was shocked to hear bagpipes were not allowed in the stadiums,” Matthew Strachan, a doctor from Aberdeenshire in Scotland, told reporters. "I've played the pipes in most of the UK stadiums and also in France during the last World Cup and they have always been gratefully received. Why then after many sporting years have the World Cup organizers decided against having them in stadiums?" 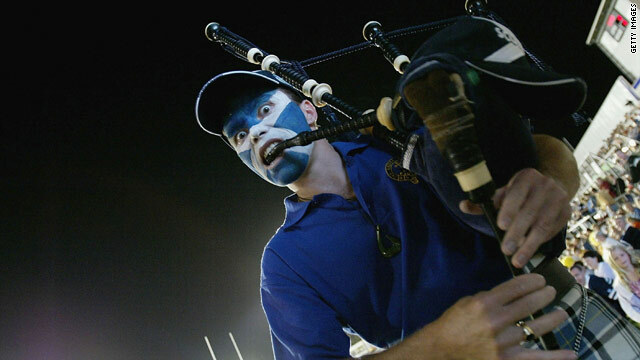 Officials have reportedly outlawed bagpipes amid fears they could distract Scotland's opponents. "When you arrive at the ground and are warming up, you quite like to hear the sound of bagpipes, Scotland’s kicking coach Duncan Hodge told the New Zealand Herald, as the team prepared to face Argentina. “The Argentineans I'd imagine would have all kinds of support, so it would be nice to cancel that out with a few bagpipes." The Scottish Government in Edinburgh was also sympathetic to the cause. "We are sure this is merely an oversight and the sports minister has written to the organizers of the rugby World Cup in New Zealand to request this position is reversed,” a spokesman told the Scotsman newspaper. As a Scotsman myself, we need all the help we can get at this tournament. Let common sense prevail here. That horrible wailing noise that scotchmen make is annoying. The sound of bagpipes I can live with. Lets ban the warm up dance thing that the All Black do. They intentional do that to put off the other team. Other teams could be put off by that so why are they allowed to do it? This is nonsense. Let us not forget: the British banned all indigenous use of language, signs, writing, musical instruments, and singing all all her abused Celtic colonies, for centuries; Jolly Old England hated the sound of the pipes before the battles, battles by locals who tried (and still trying!) to get England out of the Celtic homelands. The tradition of banning the Celtic bagpipes is very old, and very ugly. Just ask England. Dar: Its Scotsmen. Scotchmen, what an idiot. Ban the bagpipes, vuvuzelas, drums, trumpets, heck, even outlaw the mouth organ. This is a sport not the X-Factor! I am not a Scot and have never visited Scotland, however I love everything about their (Celt) culture. I am really disappointed by the double standard of the Organizers who allow the home team to display their culture but not others in the name of distracting opponents. Does the 'Haka' dance by the home team not intimidating and also a distraction to opposing teams? Events such as this should serve for promotion of good cultural heritage and should be encouraged. Being an all Blacks fan, with my seconds fav team being Scotland.....I might have to say that the all Blacks may be a bit scared of the power of the pipes over the Scots. Very dissapointed in PM of New Zealand........ his rule makes the all Blacks look like pussies. It is important for New Zealand officials to allow Scottish bagpipes at the Scots matches. Dunedin city in New Zealand is a Scottish town I will add and in fact the issue of bagpipes as a cultural consideration extends to the southern regions of New Zealand also ( -namely Otago and Southland) Dunedin is a city planned from Scotland and has pipe bands and the rugby team of the region is called the Highlanders. Every street name is from Scotland and Rabbie Burns is the city's poet. Every town in the southern region of New Zealand has a Scottish pipe band.